You've heard people say it and maybe you have even said it yourself. "Don’t worry Mom or Dad, I’ll take care of you in your old age." This always seems to be a simple loving gesture on your part as you see them beginning to age and settle into retirement. The thought of their actually failing in health or mental capabilities seems absurd or at most, years down the road. Thus it catches most children and spouses unprepared and sometimes surprised when their loved one needs care and help with daily living activities. A stroke, injury or sudden illness may result in the immediate need for a significant caregiving commitment. On the other hand a slowly progressing infirmity of old age or the slow onset of dementia may require intermittent caregiving. Either way, if you have not made provisions for this, you will accidentally become a "caregiver." "There are only four kinds of people in this world: those who have been caregivers, those who currently are caregivers, those who will be caregivers, those who will need caregivers." Statistics show that the possibility of becoming a family caregiver grows yearly. "43.5 million of adult family caregivers care for someone 50+ years of age and 14.9 million care for someone who has Alzheimer's disease or other dementia." Alzheimer's Association, 2011 Alzheimer's Disease Facts and Figures, Alzheimer's and Dementia , Vol.7, Issue 2. There are two types of caregiving scenarios, Formal and Informal. Formal caregivers are care providers associated with a service system. Service systems might include for-profit or nonprofit nursing homes, intermediate care facilities, assisted living, home care agencies, community services, hospice, church or charity service groups, adult day care, senior centers, association services and state aging services. Professional care managers and legal and financial professionals can also be of help. Some these formal caregiver services are covered by Health Insurance, Long Term Care Insurance, Medicare and VA Benefits. Otherwise for formal care where there is a charge, payment is out-of-pocket by the individual or family members. Private pay, out-of-pocket for long term care services can be costly and advance financial planning is advised when possible. Informal caregivers are family, friends, neighbors, or church members who provide unpaid care out of love, respect, obligation, or friendship to a disabled person. The number of informal caregivers range from 20 million to 50 million people. This could represent about 20% of the total population providing part-time or full-time care for loved ones. About two-thirds of those caregivers for people over age 50 are employed full-time or part-time and two-thirds of those–about 45% of all working caregivers–report having to rearrange their work schedule decrease their hours or take an unpaid leave in order to meet their caregiving responsibilities. The average amount of time informal caregivers provide assistance is 4.5 years, but 20% will provide care for 5 years or longer (National long term care survey 1999). Below are some of the activities provided by or supervised by informal caregivers. The Accidental Caregivers, involved in this type of care, will find themselves picking up a few things that need to be done or supervised in the beginning and adding more as the need increases. 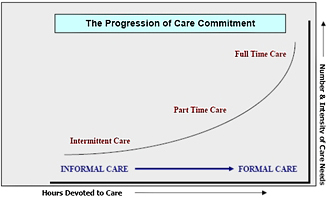 The chart below illustrates the relationship of informal care to formal care. As care needs increase, both in the number of hours required and in the number or intensity of activities requiring help, there is a greater need for the services of formal caregivers. Caregiver stress and caregiver burnout are serious issues that face caregivers providing both formal and informal care. Make certain you take care of yourself as well as take care of your loved one. The work of caregiver is difficult, but as caregiver Marlo Solitto said "Caregiving can be one of the most rewarding experiences of your life."